In the theatrical parlance of the day, the place was a Jonah, a hoodoo. Manager Adolph Philipp was able to lift the jinx but only temporarily. 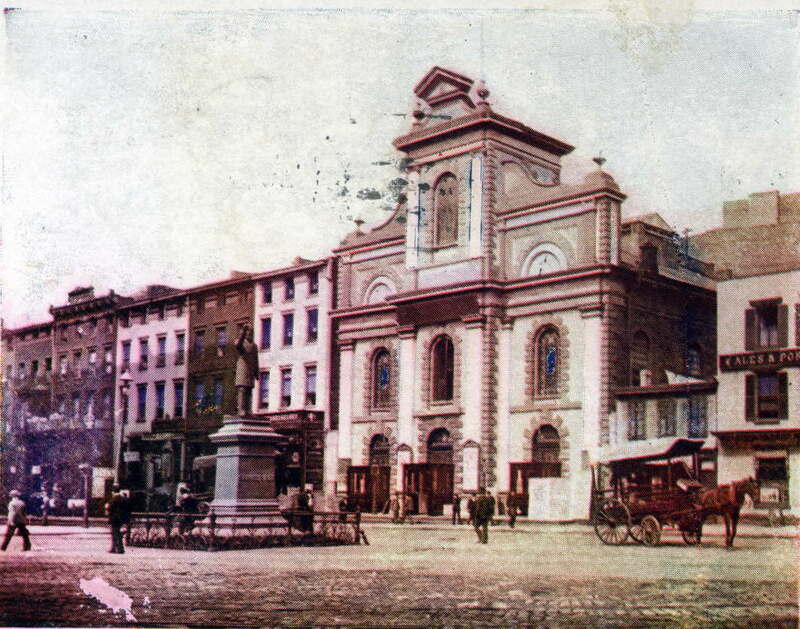 Built at Astor Place, on property belonging to Sailors’ Snug Harbor, the building had been the Church of St. Ann’s, originally Protestant Episcopal and later Roman Catholic. The structure was sold to A. T. Stewart and Company in 1871 for factory use. 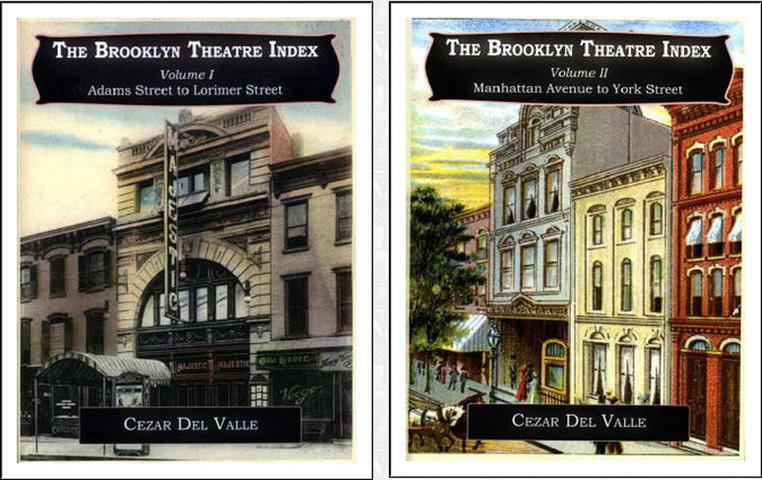 At the end of the decade, Jacob Aberle converted the space to a theatre, opening with an evening of variety on September 8th, 1879. It also served as a showcase for the questionable acting talents of his daughter Lena. The place enjoying a dubious reputation. After being dark for several months, John Thompson took over management, first naming the theatre Grand Central, a variety house opening on November 5, 1883. It became John Thompson’s Eighth Avenue Theatre with the play Ingomar on June 2, 1884 . Despite attempts at legitimacy, the place still enjoyed a certain air of unsavoriness. One production of note was Othello, presented on June 30, 1884 by the Astor Place Combination, “a company of colored actors.” Closed for a year, the theatre was finally leased, from the Stewart heirs, by John F. Poole. “suffered from a silent boycott” by local audiences. Poole closed on September 1, 1888. 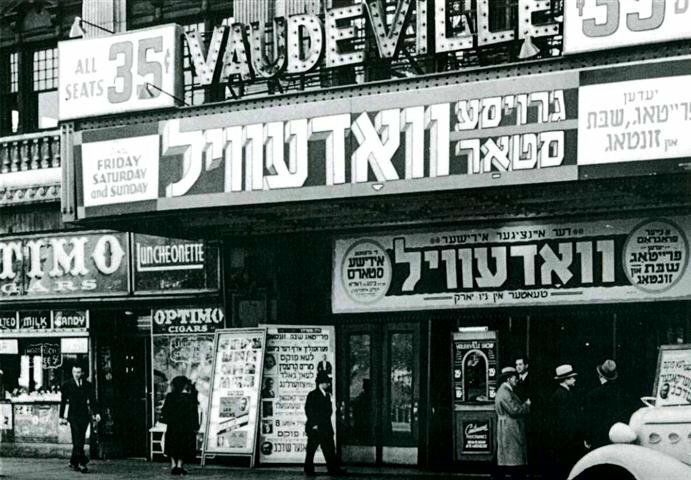 The theatre reopened briefly as a Yiddish house with King Solomon on September 21, 1888. A series of unsuccessful German productions followed at the beginning of 1889. 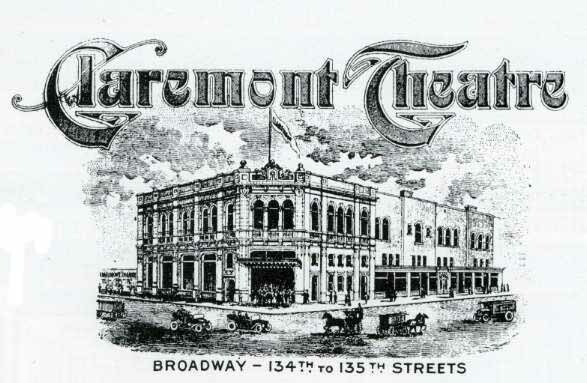 In November of that year, it became The Comedy Theatre followed by Kennedy’s Comedy Theatre in April 1890. After having been closed for some time, the house, newly painted and redecorated, now known as The Germania Theatre, threw opened its door on September 14, 1894 with Adolph Phillipp as manager. 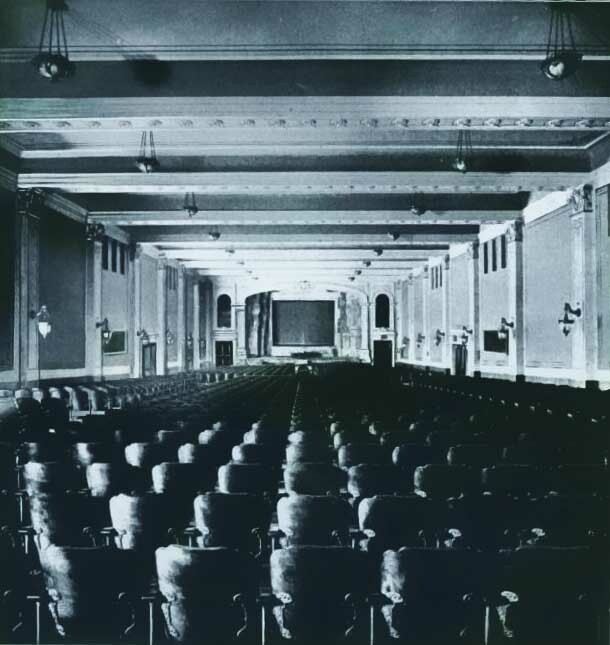 The theatre finally became a successful venue catering to the taste of German audiences. However the hoodoo, the Jonah still waited in the wings. Adolf Phillipp made arrangements for a new place on East Fourteenth Street, closing the Germania in 1903. The former church demolished a year later. 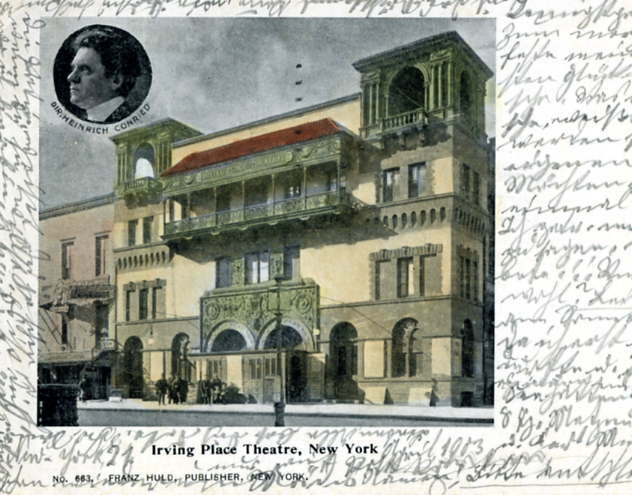 Close-up of postcard, dated April 1903, showing the Irving Place Theatre. As Amberg’s German Theatre, it opened on December 1, 1888. Plagued by financial difficulties, the Coliseum Cinemas quietly closed its doors at the end of October 2011. A rumor circulated in the neighborhood that J.C. Penny’s would move into the space. 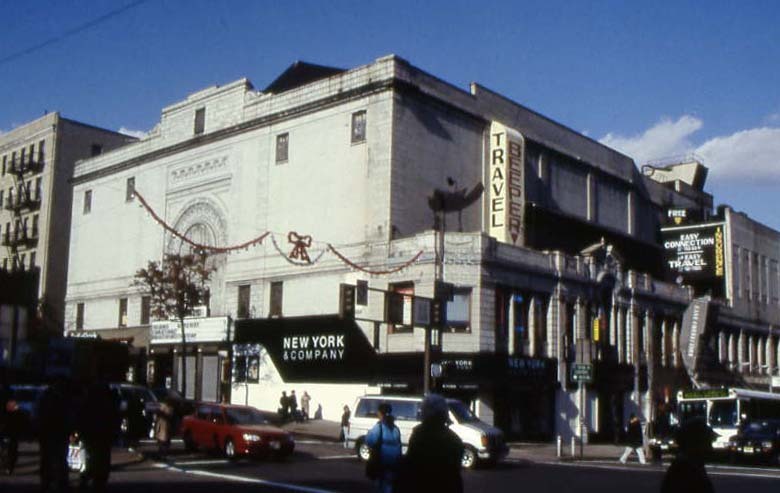 A poster, on one of blogs, suggested that the area would be best served by replacing the historic theatre with an apartment complex including stores. The Washington Heights Arts & Movies (WHAM) formed in late December to rescue and restore the theatre. It now boasts 654 members on Facebook. “With the great financial resources of the Keith interests at his command, Moss finished the new house in record time. 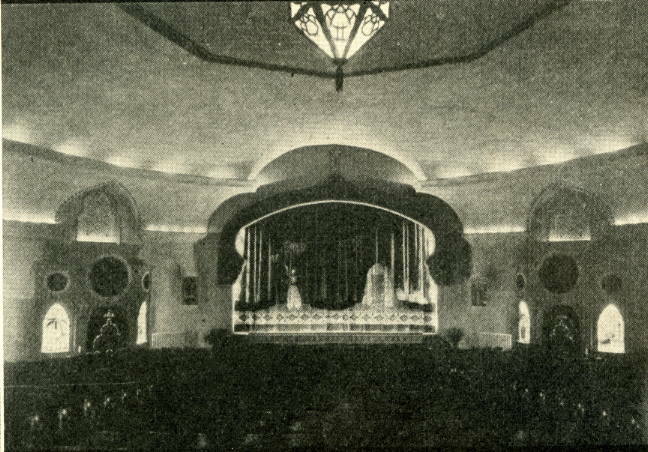 And last Thursday night, those who attended the initial performance, did so in a beautiful edifice, the interior of which is finished in ivory, gray, old rose and gold. The walls and the ceiling are filigreed and on the ceiling, over the proscenium, there is a beautiful group in relief which is patterned like a huge cameo. “The interior of the house extends in width from the front like a triangle, and despite its extraordinary hugeness, that portion of the orchestra floor extending in front of the balcony suggests coziness. “The large balcony extends upward until it almost reaches the ceiling. There is a promenade above the orchestra floor which contains, besides retiring rooms, a special sort of salon writing room done in yellow with yellow brocade curtains to match. The furniture in this room is French of the Louis XIV period. Mezzotints by American artists adorn the walls. The New York Herald, November 22, 1914: “One of the first steps toward the development of this section as a new amusement centre has been the erection by the Riverside Drive Realty Company and the Wayside Realty Company of the new Claremont Theatre, in the block front on the east side of Broadway from 134th and 135 Street. 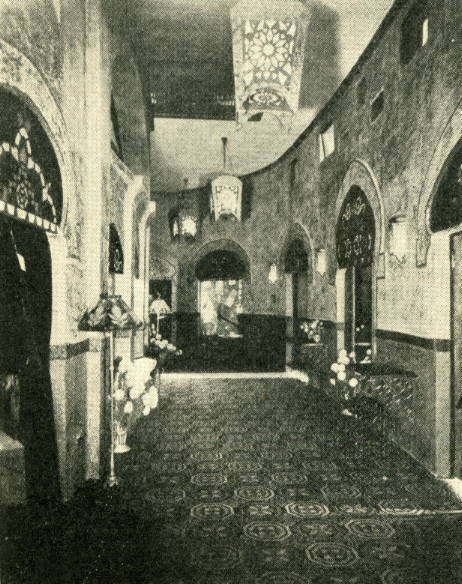 The Claremont Theatre converted to an automobile showroom in 1933. The theatre is still in operation as the Fox Cinema Center, a two screen multiplex. Exhibitors Herald-World, December 21, 1929, is part of the Theatre Talks collection. Considered one of the finest theatres in Michigan, the Gladmer made its début in 1873 as Buck’s Opera House with E. E. Myers as architect. It became Baird’s Opera House when Daniel Buck sold the space to James Baird in 1890. Facing increasing competition from other downtown houses, the theatre was extensively renovated in 1910, becoming the Gladmer, Fuller Claflin serving as architect. 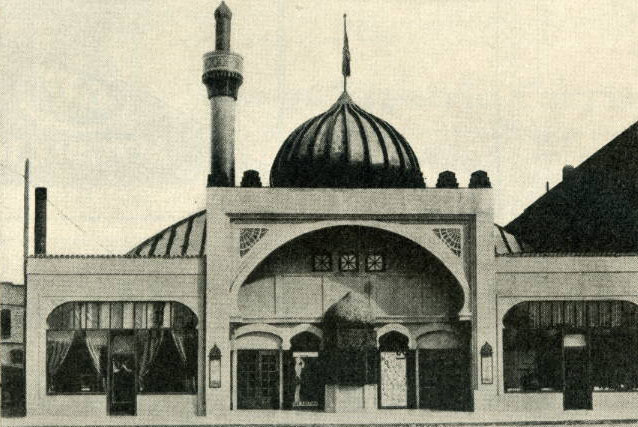 According to Lost Lansing the name derived from the owner’s daughter and son, Gladys and Merrill. 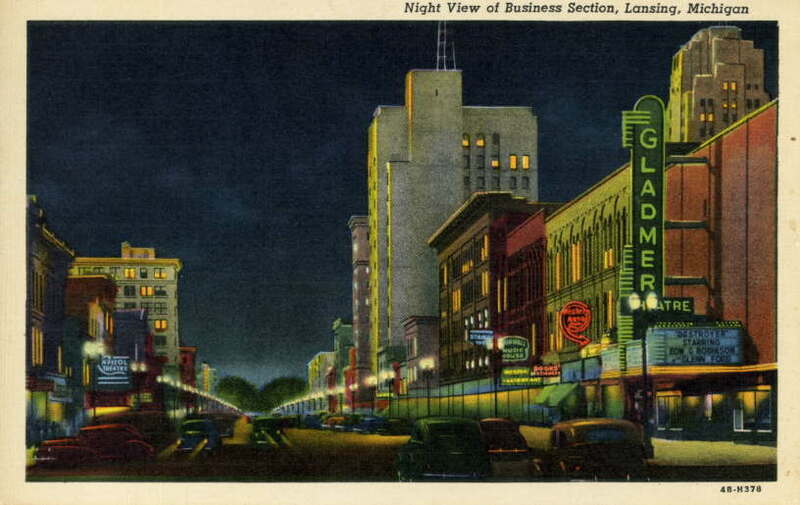 Unable to compete with the shopping mall multiplexes, the Gladmer closed its doors in 1979. One of Lansing’s finest theatres demolished.